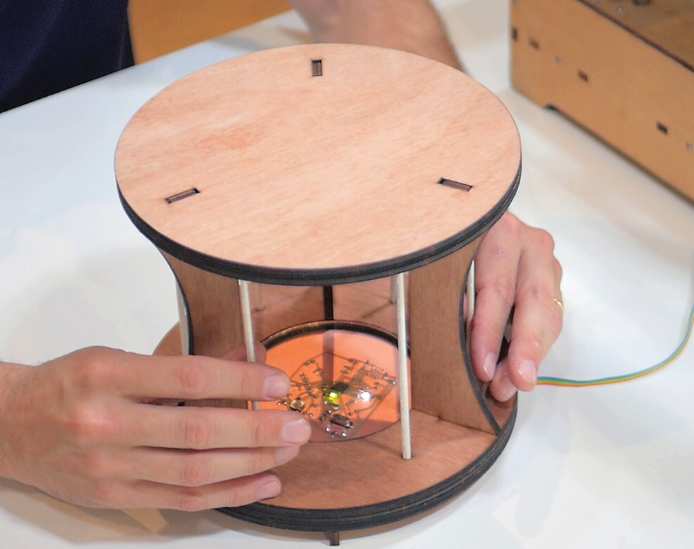 This project is to use the digital fabrication machines, to create an interface (or interfaces), to control the machines live so that they can be performed like instruments. This would require the creation of a physical interface, using either casting, cutting or printing. The interface would depend on what can be controlled of the machines, but could be traditional sliders and knobs, or accelerometers, computer vision, photo resistors, IR proxmity sensors, etc. There are no sketches for this. This proposal requires learning how to use the machines before I can fully formulate a proposal for how the interfaces would work with a performer. The Harp plays a 3D printer as a musical instrument. The interface has six rods, which when stroked cause the 3D printer to move its print head in six unique expressions. The force of the stroke controls the speed—and so the pitch—of the expression. Each expression comes from the gcode used to print each of the rods, so the instrument is in effect performing elements of its own construction. The frame is designed to look similar to the printer that is being used, an Ultimaker Original. Electronics: ATMega328-based circuit produced on a CNC milling machine, using force-sensing-resistors as input with a token LED as output, and establishing a serial connection to an Ultimaker. David McCallum has made this project.